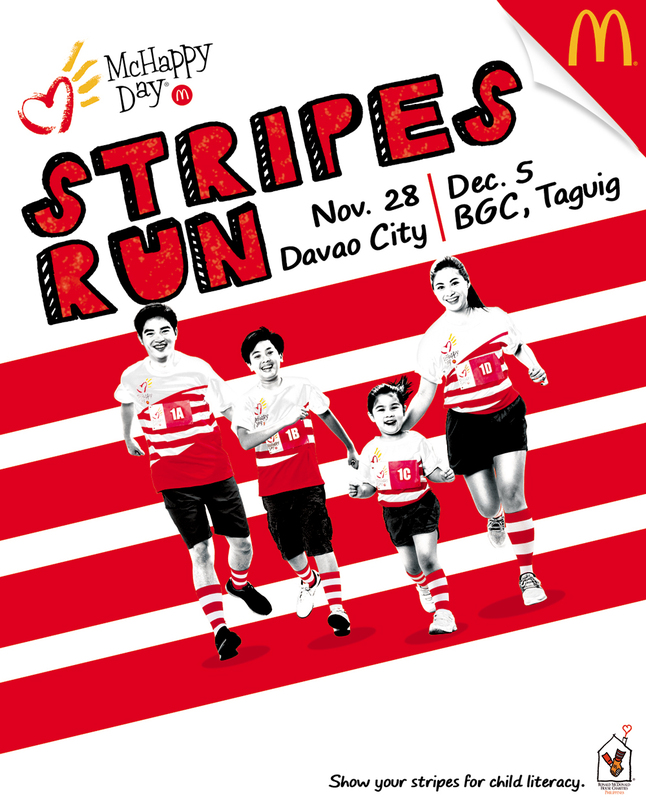 It’s the biggest McHappy Day Stripes Run yet as this year’s Davao and Manila fun runs gather close to 7,000 participants in support of helping kids learn how to read. Last December 5, McDonald's gathered close to 4,000 runners at Bonifacio Global City to run for a cause at the McHappy Day Stripes Run 2015. This year, McDonald's lined up fun race categories for every member of the family, exciting surprises and various fun fair activities. The annual McHappy Day Stripes Run is McDonald’s Philippines’ fundraising event in support of Ronald McDonald House Charities’ flagship program, Ronald McDonald Read To Learn. The program, in partnership with the Department of Education, aims to help Grade 1 and 2 public school students from all over the country learn how to read. Beneficiaries of Ronald McDonald Read to Learn are provided with a set of big books and training for teachers who will facilitate the program. With proceeds from the run in Manila and Davao held last November 28, McDonald's has raised over 2 million pesos to share the wonderful gift of reading to more kids nationwide. Since it began in 2002, the program has helped over 11.5 million kids in the 7,500 partnership schools. "McDonald's has always had a special spot for children. We know the best way to make a difference in their lives is to help them learn how to read and have a chance for a better future. Through initiatives like the McHappy Day Stripes Run, McDonald's is able to open opportunities for families to help while having fun." said Kenneth Yang, McDonald's Philippines President and CEO. Making this year’s McHappy Day Stripes Run more memorable was the support of McDonald’s brand ambassadors Alden Richards, Enrique Gil, Xian Lim, Matteo Guidicelli, Luis Manzano, Toni and Alex Gonzaga, Jeron Teng and Alonzo Muhlach. Other celebrities who showed their stripes in support of the Ronald McDonald Read to Learn Program include, Tim Yap, Mike Tan, Pancho Magno, Rich Asuncion, Ryza Cenon, Kristoffer Martin, Martin del Rosario, Joyce Ching, Derrick Monasterio, and Julian Trono. Share your photos of the McHappy Day Stripes Run by using the hashtag #McDoStripesRun and tag @McDo_PH on Twitter and Instagram.